Would You Let an Expert FaceTime You to Check Your Car Seat? Worried you didn’t set up your car seat right? You have reason to fret: As many as 93 percent of first-time parents get it wrong. But this could change, thanks to a new video chat initiative from a handful of forward-thinking brands. When you’re faced with an overwhelming amount of things to consider after giving birth, the last thing you should be worrying about is whether you’ve installed your car seat right. But having an adequate car seat is the one thing the hospital is going to be concerned with when you venture out its doors—and for good reason: a safe, rear-facing car seat can be a matter of life and death. 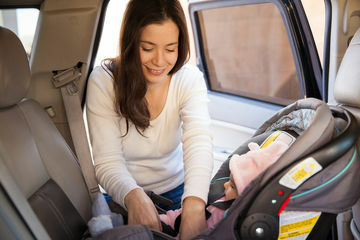 Yet, as much as 93 percent of new parents make at least one mistake when installing a car seat, according to a recent study, and so, manufacturers are taking matters into their own hands to ensure customers are using their products correctly and safely. Dorel Juvenile is one of these firms, claiming to be the first manufacturer to deliver personalized instruction on installing a car seat by FaceTime or Skype. The program was developed last year to give parents the confidence that their car seats are installed correctly, and since the launch of the program, Dorel receives around 100 video calls a week from concerned parents. Here’s how it works: If you’ve purchased a Maxi-Cosi, Quinny, Safety 1st, Cosco or Eddie Bauer car seat, you can call Dorel customer service to set up an appointment for a video chat. A certified passenger safety technician (CPST) will call you via Skype or FaceTime, virtually peering into your car to literally show you what you could be doing wrong (they won't judge you if your back seat is a mess, don't worry!). And you don't actually have to be a Dorel customer, either. “If any consumer calls in for help with car seat installation or safety related questions we will take that call to the best of our ability,” says head of the program Michelle Williams. As a soon-to-be new mom with a Safety 1st car seat, I took the company up on its offer and set up a FaceTime call with Williams herself. And as a paranoid-preggo, I was really relieved that I did. While the seat itself was fairly easy to install, actually having an expert walk me through the instructions and reassure me that everything I was doing was right felt so good—and I was so glad I wasn’t trying to figure it out for the first time in the hospital parking lot (since that would surely put any new mama into a fit of hormonal frustration). According to the aforementioned study, ensuring your seat is installed properly with a CPST prior to your baby’s delivery had a 13-fold decrease in the likelihood of errors. Of course, before an initiative like Dorel’s, tracking down an expert meant searching www.safecar.gov or www.seatcheck.org and reaching out to them IRL, and who really has time for that between prenatal appointments and registry planning? Busy, safety-conscious moms rejoice!